The NEW Turquoise Dandy Damask Dress was featured in the previous post. Now here are pictures of the coordinating Dandy Damask bib, burp cloth, and lovey. The blanket is also available (no picture yet). Order the entire gift set or mix and match for your own creative gift set. Great for baby shower gifts, welcome home gifts and first birthday party gifts. Turquoise Dandy Damask Lovey "Lovaroo"
Dress and Bib for the baby or toddler who drools or makes messes, but still wants to look stylish. Also great combination for first birthday party. 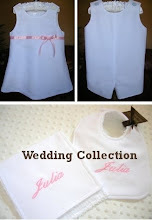 Cover the dress with the matching bib for the smash cake pictures. Gift set in girl gift box, just $5 more.